The massively-popular NBA 2K console basketball franchise launches on iOS devices for the first time with NBA 2K12. It'll cost just £2.99 for iPhone and £6.99 for iPad and is available to download now. 2K Sports has launched its popular console basketball franchise for the Apple iPad, iPhone and iPod touch for the first time. NBK 2K12 arrives alongside the console version of the games and is available to download from the App Store now, costing a fraction of the price of the Xbox 360 and PS3 titles. The game features full five-on-five action, including all 30 NBA teams and complete 2010-2011 rosters. It offers the chance to play through a full NBA season or simply enjoy a single game. For old-school hoop fans there's also a Jordan Challenge mode, which allows you to play through some of the finest moments of the legendary Michael Jordan's illustrious career. Naturally there's Game Centre integration, which allows you to compete on global leaderboards. 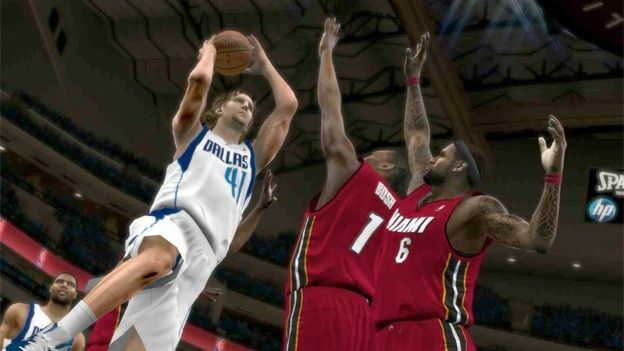 NBA 2K12 will cost just £2.99 for iPhone and iPod touch owners, while the iPad app will be £6.99. It will be interesting to see how the game performs. Console to mobile conversions have had some great success stories, like Dead Space and Tiger Woods golf for example, but there have been some misses too. First up for 2K sports is to overhaul EA Sports' NBA Jam, which offers a more cartoonish version of the game of basketball.